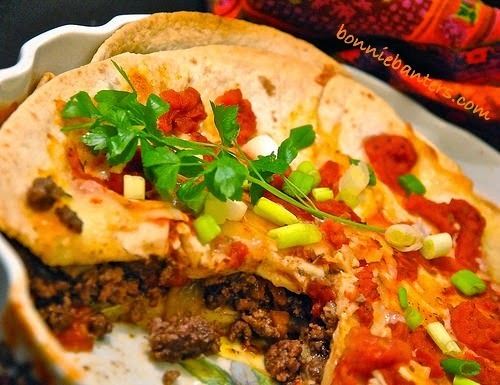 Bonnie Banters: Delightfully Seasoned Beef Taco Pie with Pepper Jack Cheese ~ My Happy Pie! Brush the baking dish or pie plate with the olive oil. Spread 1/2 c.* of the tomatoes (with the juices) on the bottom of the baking dish. Overlap 3 whole tortillas over the tomatoes and up the sides of the dish. In a large skillet, over medium-high heat, cook the beef (while breaking up with a fork) along with the onion and sweet pepper until the beef is browned. Add the chili powder and cinnamon, then cook and stir for 1 minute. Stir in 1/2* (approx. 2/3 c.) of the remaining tomatoes with juices and simmer uncovered for 2 minutes. Pour and spread the beef mixture over the tortillas in the baking dish. Cut the remaining two tortillas into about 2" strips. 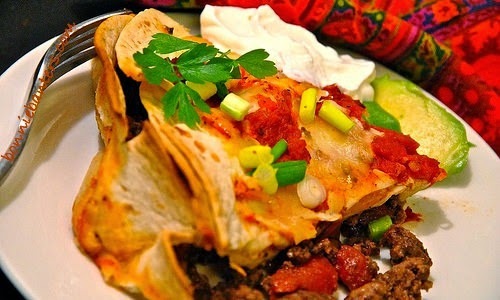 *Lay the strips of one of the tortillas over the beef mixture and scatter with 1/2 c.* of the cheese. 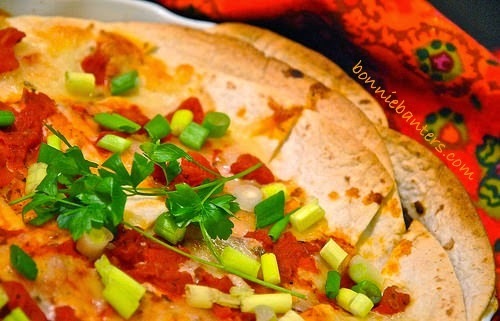 Lay (in the opposite direction of the last layer of strips) the other cut-up tortilla over the cheese layer and sprinkle with the remaining 1/2 c.* of cheese. Top with the rest* of the tomatoes and juices. Let stand 5 minutes before serving. Cut into wedges and serve with your choice of the above suggested toppings and garnishes. Refrigerate leftovers up to 4 days (that is, if you have any!). You can freeze the cooked casserole up to 3 months. I experimented with 1 lb. ground beef chuck; however, the pie is better with 12 oz. With the ground beef chuck, there's no need to drain the fat. You can substitute Cheddar cheese if you prefer. I layered the pie a little differently than the original recipe. All The Toppings and Garnishes! It's hard to eat just one slice of this tempting pie...you have two pie dishes, right? Enjoy it with a tossed salad or my Simple Avocado Salad! Cinnamon? What a twist and bring on the pepper jack, sounds great. I still think you're trying to steal my husband as he loves any kind of taco, ha ha!